Get your motor running, head out on the highway... It conjures up images of getting out of town out onto the open road, a Harley1s natural territory but must it always be that way? The answer is not necessarily. The city has its own appeal and where London is concerned that appeal is stronger than just about anywhere else on earth. London is a spectacular city, possibly the most spectacular in the world and with each month that passes it gets more spectacular. The architectural growth, particularly along the river from Chelsea to the city and within the city itself, not to mention the docklands, is probably greater than at any time since the immediate post war period. The difference today is that it’s a lot better and it needs to be seen. Chelsea & Fulham H.O.G. took a city ride along the banks of the Thames, down Cheney walk past the marina, and the giant new apartment blocks mushrooming on the South bank. Over Lambeth bridge and through the labyrinth of back streets around the Mayors radical new office to Tower Bridge. What a view that is, crossing the water at this point and heading toward the boiling cluster of buildings competing for sunlight in the square mile. With a second high rise in the shape of the gherkin to keep the NatWest Tower company, it’s acquiring a skyline that can be seen from the M25. Glance down river and there in glistening competition is the clutch of glistening towers on Canary Wharf, our own Manhattan, marvellous. Scottie’s convoy protocols of drop off riders worked well at keeping the group pretty much together or at least ensuring no-one got lost as we threaded through the city, past St. Pauls and down the Strand to Trafalgar Square. I nipped ahead here and took up a position in Whitehall from where I got the only decent shot of the ride out, with Nelson’s column overseeing proceedings from his lofty perch. The run ended up in Richmond at the... pub close to the centre. A good venue with ample off street under cover parking and decent bar meals. 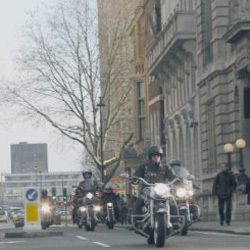 City ride outs in winter work. You don1t keep going at speed long enough to get cold but you spin the wheels and see some sights and have a gathering point at journeys end that rounds things off nicely. A brief stop off somewhere spectacular on route for a group shot next time maybe?